Jersey! A right side and a wrong side? Many will look for the little "V" shapes, the knit stitches, as seen in the top fabric, and automatically declare it the right side. Personally, I often use the more textured side of a knit as the public side when making a garment. But maybe I'm weird. With weft knitted fabrics (See Knit Fabric Glossary. 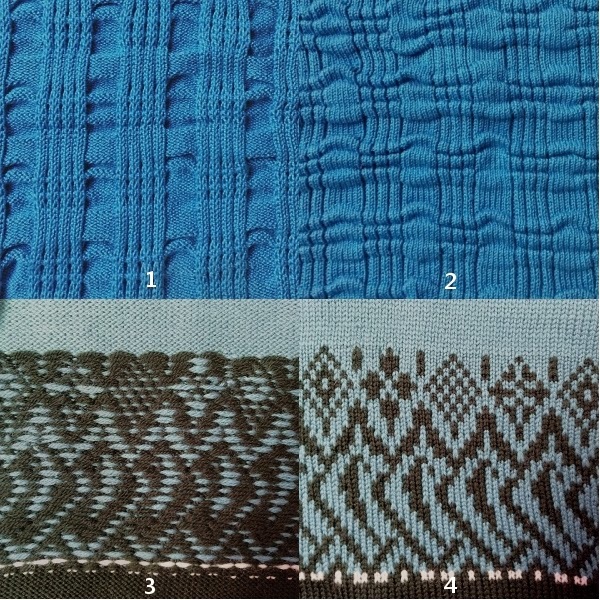 ), knit stitches can appear on one side of the fabric (with jersey) or on both sides of the fabric (with knits other than jersey). Textile designers refer to the side of a knit fabric with the most knit stitches as the "technical face". Technical face, however, doesn't necessarily mean the right side. For instance, if the fabric is a jersey (top fabric in picture above), we're using the technical face as the right side. But if a fabric is a reverse jersey (bottom fabric), we're using the "technical back" as the right side. Want to turn a jersey fabric into a reverse jersey fabric? You guessed it... flip it over! Either side is a valid right side. In my last post The "Right" Side of Knit Fabric - Part 1, I presented six pics of fabric. Here are the first four. Picture 1, now returned to its actual color, is a rib fabric and is the technical back of the fabric in picture 2. The fabric in picture 3, a two-color jersey, is the technical back of 4. In Part 1 of this series I asked several questions hoping to elicit discussion. Thanks to all who responded: a Twitter reply here and there, a Google Plus convo that's veered delightfully off topic now, and Instagram responses including nice comments on my (unknown to them at the time) "green filter" fabric. (Sorry for the deception, folks.) There were also an interesting comment on Facebook and a couple of very thoughtful (and lengthy) answers to my questions via email that were much appreciated. And thanks, Brooke, for leaving a comment in the actual comment section of the post! 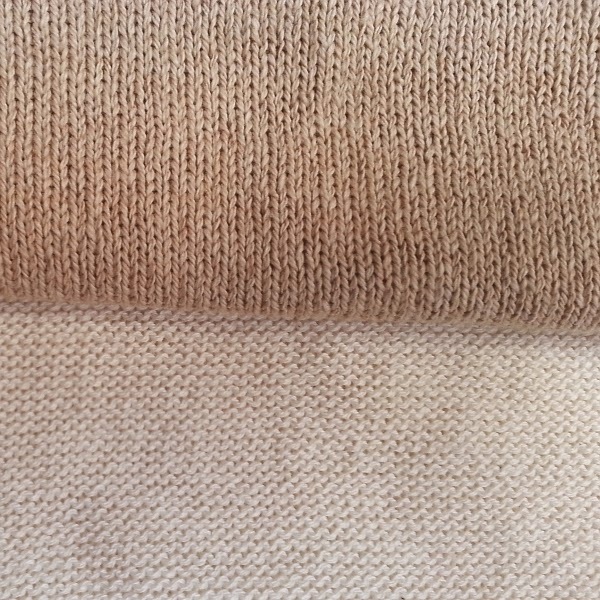 Since I often read or hear people asking for help determining the right side of knits, I thoroughly enjoyed reading everyone's posted thoughts and comments on the topic, wherever they were left. Several people stated in different ways that the "right" side of a knit fabric can be either side. It truly is whichever side you decide will work best for your particular project. There is no pre-determined method to figure it out, and there's no need to worry about making a mistake by using the "wrong" side. I suppose that if it's a printed knit (generally not the sweater knits I talk about here), you'd probably want the print to be on the outside. Maybe. Wouldn't it make a lovely cardigan with a print on the inside that you could flash every now and then? You think? You may have noticed that I haven't gotten around to pictures 5 and 6 from the original post. Next time. I've got even more to say on this subject! There'll be a Part 3. I have actually seen a printed knits with the print used on the inside of rtw cardigans! It was a thin, light-colored sweater knit and it was printed with half inch diameter polka dots. By using the unprinted side as the outside of the cardigan, the dots showed though and looked splotchy & distressed giving them a nice vintage look. It was really cool and I seriously considered buying one that was cream color with printed coral dots. I love the idea of the print on the inside showing right through to the outside in a subtle way! I don't think I've ever seen that.